Scenes of American Life, (American, about 1920), possibly made by Mrs. Cecil White (probably Hartford, CT). Cotton plain weave, twill, and compound weave; silk plain weave, pieced and applied top tied to backing. Helen and Alice Colburn Fund, Elizabeth M. and John F. Paramino Fund in memory of John F. Paramino, Boston Sculptor, Frank B. Bemis Fund, and John H. and Ernestine A. Payne Fund (2018.119). Photograph © Museum of Fine Arts, Boston. On the heels of a series of posts inspired by the iconic pictorial quilts of Harriet Powers comes a pieced and appliquéd quilt of a later generation—a top acquisition to the MFA’s textile collection in 2018, regarded as one of the most important American pictorial quilts of the 20th century. Scenes of American Life was purchased at auction at Skinner, Inc. earlier this spring and named as such since it was first published in Safford and Bishop’s 1972 publication, American Quilts and Coverlets. 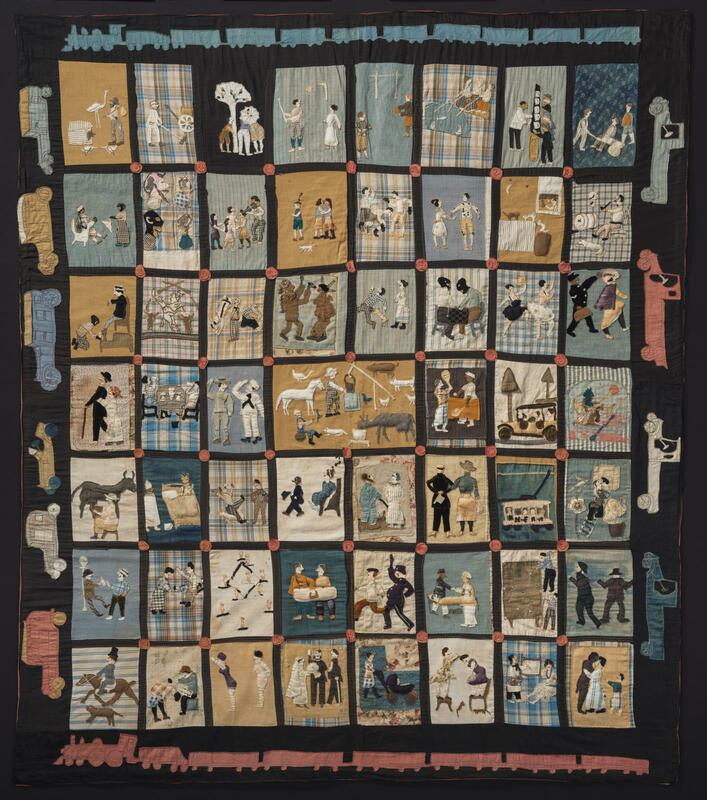 The quilt is populated with a dazzling array of vignettes, fifty-five in total, depicting figures engaged in a variety of pursuits. Among the scenes, we see a bartender serving his patrons, a rodeo star, tennis players, golfers, baseball players, a billiards scene, sweethearts, a man who has climbed up a ladder to his paramour, a man in uniform, and a man getting his shoes shined. The quilt squares are framed with strips of black cloth and adorned at each point of intersection with layered circles of fabric forming delicate rosettes. The compositions are rendered with an authentic freshness that suggests the maker worked from direct observation. In the quilt’s outer borders, touring cars, pickup trucks, and steam locomotives frame the collection of scenes. Scenes of American Life, detail view of lower right corner. Among the scenes are a police officer in pursuit, billiards game, mother and child with stroller, painter with model, and interracial couple in embrace with child looking on. Cotton plain weave, twill, and compound weave; silk plain weave, pieced and applied top tied to backing. Photograph © Museum of Fine Arts, Boston. Recently, an energetic group of graduate students, academics and curators came to visit our study center as participants in a roundtable discussion. Designed to solicit diverse voices and perspectives, a recent institution-wide initiative at the Museum of Fine Arts, Boston, this convening was the third in a series of focused discussions about our American quilt collection. The first order of business was a chance to view the MFA’s recently-acquired Scenes of American Life. A buzz of multiple conversations emanating from shoulder-to-shoulder viewers surrounding our 5′ x 10′ viewing table rose above the textile field laid out for all to see up close. Comments ranged from observations about specific details seen in the various vignettes, to relationships existing between discreet parts, to understanding the quilt within an American historical context and in light of its probable city of origin, Hartford, CT. 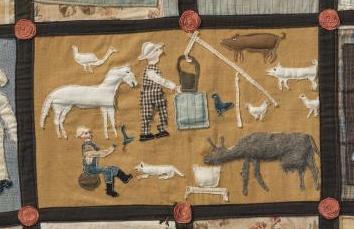 Scenes of American Life, detail view of middle quilt block portraying agricultural life. Cotton plain weave, twill, and compound weave; silk plain weave, pieced and applied top tied to backing. Photograph © Museum of Fine Arts, Boston. 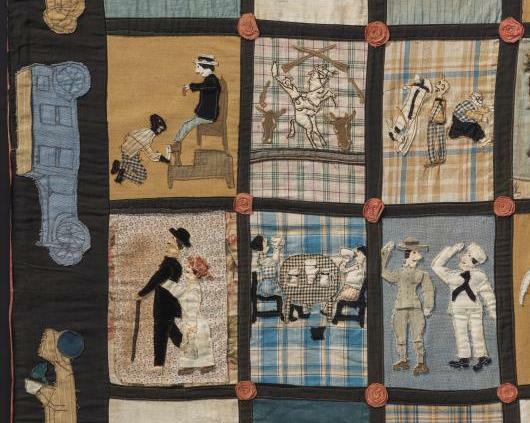 The scene on the left, which is double the dimensional width of all the others and located smack in the middle of the quilt, is a scene on a farm that some interpreted as reminiscent of an agricultural past. Radiating from this central scene that calls to mind an “origin story” of our American roots with nostalgia for a simpler way of life, the surrounding vignettes and quilt borders provide the counter narrative in their evocations of rapid industrialization and increased mobility, life in urban centers, the social value of games and sports, the growth of small business, family life, and racial relations (look for two quilt blocks in particular: one depicting two interracial tennis players, and the other showing an interracial couple embracing, with a child looking on). Scenes of American Life, detail view left of center. Scenes depict a shoeshine, rodeo star, men in uniform and images of family life. Cotton plain weave, twill, and compound weave; silk plain weave, pieced and applied top tied to backing. Photograph © Museum of Fine Arts, Boston. 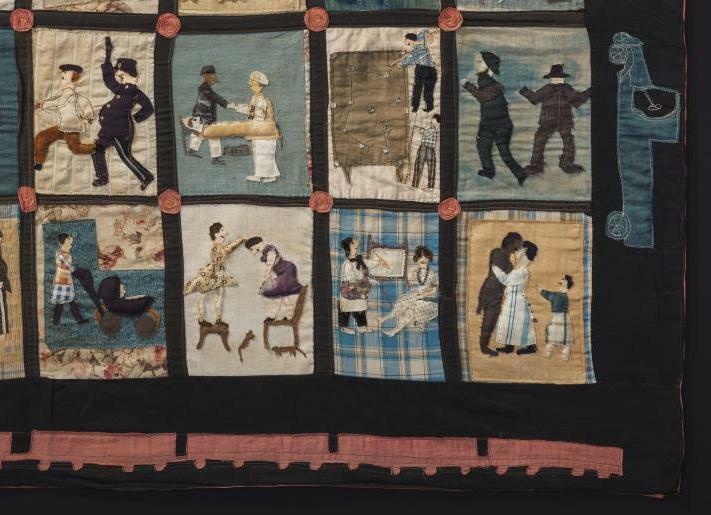 There is some debate as to the racial identity of Mrs. Cecil White, the woman thought to have created this quilt that was first discovered at an estate sale in the late 1960s in Hartford, CT. Despite this gap in our knowledge about the maker, perceiving Scenes of American Life in its entirety and in the context of its time evinces a rich and layered story of our nation’s past, present and future as envisioned by the artist, articulated with honesty and charm in common, everyday fabrics. Object a Week is a revolving showcase of textile collections at the Museum of Fine Arts, Boston. 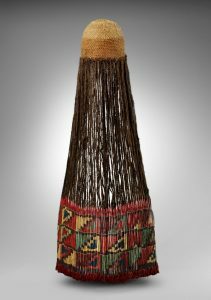 A featured object may be indicative of the author’s study focus at a given moment and/or related to topics of research, activity, or recent acquisitions in the Museum’s Textile and Fashion Arts department. For more in-depth explorations of the collection, see A Closer Look.